Volunteers have upgraded a section of Wainwright’s Coast to Coast Walk in the Yorkshire Dales. The 220m stretch of the popular long-distance route in Swinner Gill in Swaledale had become badly degraded. The trail is used by 7,000 people each year and the thousands of boots had taken a toll on the path, east of Keld, which had become boggy. 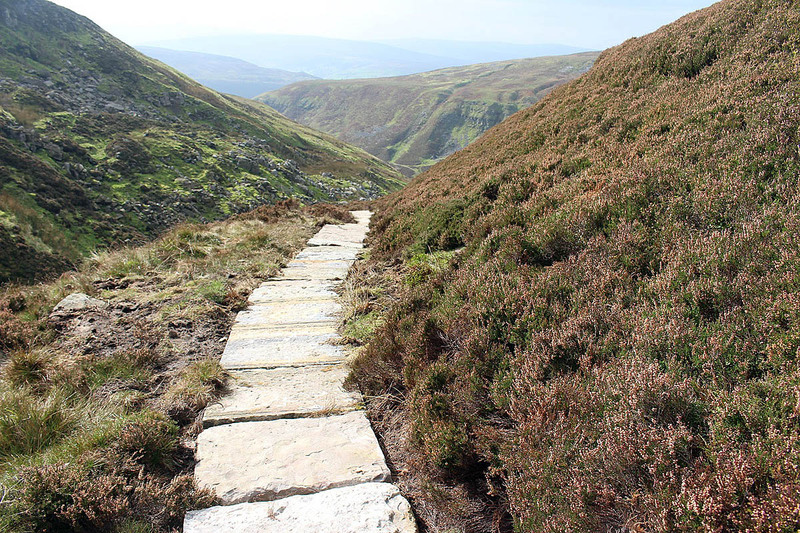 The Yorkshire Dales National Park Authority said the steepness of the gill and its designation as a site of special scientific interest meant that access to the path was difficult and any work needed to done in a limited time. Area ranger Michael Briggs said: “Contractors were an option, but an expensive one. 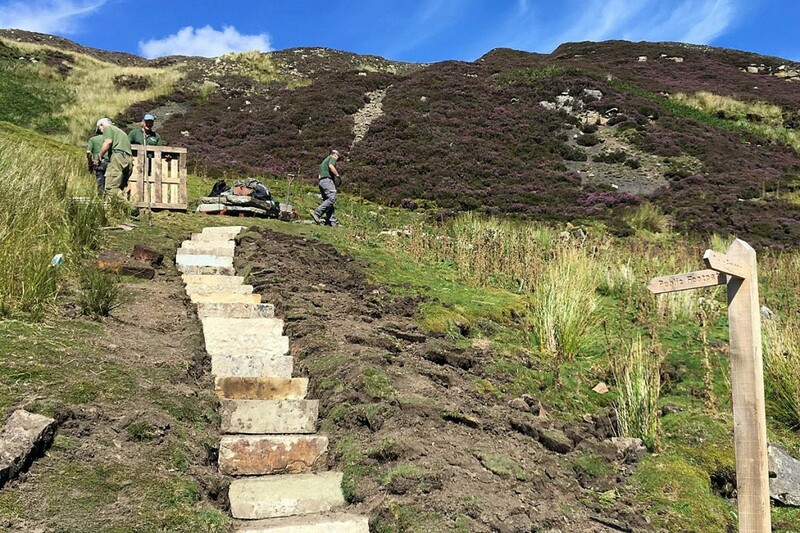 After a day-and-a-half of airlifting flags by helicopter, rangers and volunteers laid 432 flags, built three large stone flag bridges, created two flights of steps with 19 steps in each, and constructed 12 cross channels. Work started on 9 August and finished on 7 September. During the project 16 volunteers put in the equivalent of 68 days’ work. Head of park management Alan Hulme said: “The challenge of tackling such a large scale project within a set timeframe has changed the view in many quarters both internally and externally as to what can be achieved through the willingness of volunteers if given the opportunity. The authority said flagged paths can be seen on several high routes in the Pennines. Although labour intensive to lay, they create a hard-wearing, long-lasting and easy-to-use surface. The flags mean that areas of erosion can recover and vegetation grow back, reducing further damage to peatland habitat, it said. Mr Briggs said every flag told a story: “We try to source reclaimed flagstones and on this occasion they were supplied by Metcalfe Reclamation from Heywood in Greater Manchester. We use sandstone flags as they won’t polish over time and become slippery – like limestone would. Cash for the purchase of the flagstones and the airlifting to site was funded by the park authority’s public rights of way budget. We are hoping to come from Australia in July 2018 to walk Wainright's Coast to Coast so very much appreciate the efforts of the volunteers and look forward to experience their work. A big thank you to all concerned.